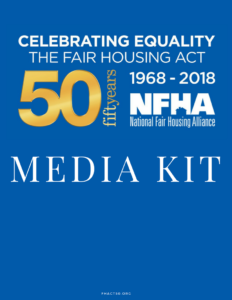 As part of the FHAct50 Campaign, NFHA is making a number of resources available to our members and partners to amplify the celebration within their own commemorative activities and events. Additional resource materials will be made available over the course of 2018. Download our media kit for general information about the campaign, a campaign fact sheet, information on NFHA speakers, and more.